Tonight was the last baseball game played at historic Rosenblatt Stadium. Rosenblatt is best known for hosting the NCAA Div. 1 College World Series. But it has been the home to baseball - professional baseball for longer than anything else. Sadly, they are going to tear this grand place down. Our son, Justin worked for the Omaha Royals for three summers. He worked in the promotions department. Worked his way up to head mascot - Casey. 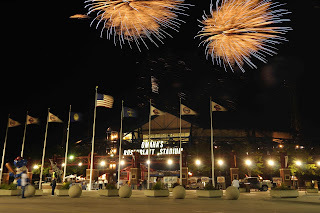 So I thought I would attend this last game - here is a shot of the fireworks following the game.